War Memorial Stadium is a multi-purpose stadium in Little Rock, Arkansas. The stadium is primarily used for American football and is the home stadium for the Arkansas Baptist Buffaloes, Catholic High School Rockets, Little Rock Rangers and the secondary home stadium for the University of Arkansas Razorbacks. The Arkansas State Red Wolves have also played there in the past. The stadium also hosts the Delta Classic, an annual football game between the University of Arkansas at Pine Bluff Golden Lions and the Grambling State Tigers, as well as hosting the Arkansas Activities Association high school championship game in all classification. War Memorial Stadium finished construction in 1947 and had a seating capacity of 31,075. On September 19, 1948, the stadium was formally dedicated by former Arkansas Razorback and Medal of Honor recipient Maurice Britt. Britt dedicated the stadium to "the memory of her native sons and daughters who have given so much that we might have our freedom." Following the dedication ceremony, the first game at the stadium commenced, where the Arkansas Razorbacks defeated the Abilene Christian Wildcats by a score of 40–6. War Memorial Stadium during a Catholic High School football game. War Memorial Stadium has added numerous improvements to the stadium and to the playing field. A complete lighting system and an AstroTurf surface were installed for the 1970 season. A new artificial surface was installed in 1974 and also again prior to the 1984 season, before a returning to natural grass field in 1994. Artificial turf was reinstalled prior to the 2002 season when AstroPlay was installed. A new scoreboard and video screen were added prior to the 2005 football season and the field was later upgraded to field turf in 2006. Renovations to the club facility and press box began on December 14, 2009, following the 4A Arkansas Activities Association high school football championship game. The renovations cost approximately $7.3 million and was completed in August 2010. The renovations also included the Sports Media Legends Wall of Honor, honoring Arkansas sports journalists that distinguished themselves in their careers and have made contributions to the stadium and to the sport. AT&T signed a sponsorship agreement with the War Memorial Stadium Commission to name the playing field AT&T Field on June 23, 2010. The naming rights of the playing field last for at least five years with an option for a 10-year agreement. With this agreement, War Memorial Stadium will earn $175,000 per year for the first five years with a 2.5% annual increase after the initial five years. In addition to athletics, the stadium has been used for a variety of other purposes including musical concerts and speaking engagements. In 1995, Billy Joel and Elton John performed to a sell-out crowd of 41,274, grossing over $1.6 million for concert promotor Cellar Door Concerts. Other artists who had performed at the stadium are The Eagles, The Rolling Stones, George Strait, and 'N Sync, among others. Reverend Billy Graham conducted his evangelistic crusades to thousands of listeners at the stadium that included a young Bill Clinton in 1959. Graham returned to the stadium in 1989. 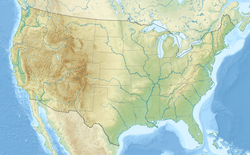 Months prior to the 1956 NAIA football season, the National Association of Intercollegiate Athletics (NAIA) began searching for cities to host the inaugural NAIA championship game. As it appeared that the championship game was headed to Shreveport, Louisiana, the Louisiana legislature passed a bill banning integrated sporting events in the state. Since some of their member colleges had African-American athletes, NAIA looked for another city to host the game. War Memorial Stadium general manager Allen Berry worked with local businesses and the Little Rock Chamber of Commerce to raise $25,000 to get NAIA to host the game in Little Rock. Both Aluminum Company of America and Reynolds Metals Company agreed to pay $25,000 each to CBS to broadcast the game nationally and this agreement led to the game's name, the Aluminum Bowl. The NAIA invited the Montana State University Bobcats and St. Joseph's College Pumas, the two leading NAIA football teams at that time, to play on December 22, 1956. The final result was a scoreless tie, and the teams were named NAIA co-champions for the 1956 season. Despite promotion of the game by local organizers, only 5,000 spectators attended the game. Organizers failed to keep the championship game in Little Rock and the game moved to St. Petersburg, Florida in 1957. ^ Carter, Mark (July 28, 2009). "War Memorial: A One-Day Lambeau South?". Arkansas Sports 360. Retrieved December 30, 2010. ^ Horton, Aaron D. (November 5, 2012). "War Memorial Stadium". Encyclopedia of Arkansas History & Culture. Retrieved August 21, 2013. ^ a b "War Memorial Stadium". University of Arkansas Media Relations. Retrieved January 3, 2011. ^ Hunt, Donald (October 18, 2006). "Arkansas-Pine Bluff surprises Grambling State". ESPN. ^ "War Memorial Stadium, Little Rock, Pulaski County". Arkansas Historic Preservation Program. Retrieved December 30, 2010. ^ "Arkansas to play on new FieldTurf surface in '06". Associated Press. ESPN. June 15, 2006. Retrieved January 3, 2011. ^ "Press Box Construction Begins" (Press release). December 11, 2009. Retrieved January 3, 2011. ^ "War Memorial Stadium Honors Sports Media Legends". KATV. September 10, 2010. Retrieved January 3, 2011. ^ Lesnick, Gavin (June 23, 2010). "AT&T buys naming rights for War Memorial field". Arkansas Democrat-Gazette. Retrieved January 3, 2011. 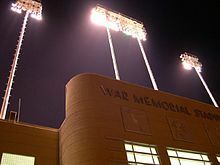 ^ "War Memorial Stadium Commission, AT&T Sign Naming Rights Pact for Surface of Historic Stadium". Newport Television. Fox16.com. June 24, 2010. Retrieved January 3, 2011. ^ "Amusement Business: Boxscore Top 10 Grosses". Billboard. Nielsen Business Media, Inc. 107 (17): 13. April 29, 1995. ISSN 0006-2510. Retrieved December 30, 2010. ^ "Homes Sweet Homes". University of Arkansas Media Relations. Retrieved January 3, 2011. ^ "PopOdyssey 2001 Tour Kicks Off Today". Yahoo! Music. May 23, 2001. Retrieved January 3, 2011. ^ Clinton, Bill (2004). My Life. New York: Knopf. p. 39. ISBN 0-375-41457-6. ^ a b c d Edwards, Paul. "Aluminum Bowl". Encyclopedia of Arkansas History & Culture. Retrieved January 2, 2011. ^ "Coming Events Dec. 21 Through Jan. 4". Sports Illustrated. December 24, 1956. Retrieved January 2, 2011. ^ "Football Program". 2010-2011 NAIA Football Coach Manual (PDF). p. 8. Retrieved January 2, 2011. ^ "Past Champions". 2010-2011 NAIA Football Coach Manual (PDF). p. 9. Retrieved January 2, 2011. 1969 "Game of the Century"
This page was last edited on 27 February 2019, at 15:29 (UTC).